The process for making Cadbury Flake is a closely guarded secret and no other chocolate manufacturer has ever managed to recreate it. 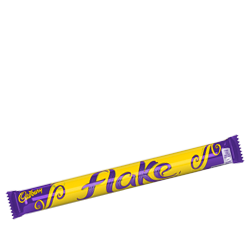 That's why no other chocolate bar can rival the delicate, crumbly texture of a Cadbury Flake. Milk, sugar, cocoa butter, cocoa mass, whey powder (from milk), vegetable fats (palm, shea), emulsifier (E442), flavourings. MILK SOLIDS 14% MINIMUM. COCOA SOLIDS 25% MINIMUM. CONTAINS VEGETABLE FATS IN ADDITION TO COCOA BUTTER.